Mesotherapy for Hair Growth – What You Need to Know About It? Hair loss is a chronic problem, which is seen throughout the world nowadays. Be it severe illness, side effects of medications, premature ageing, hormonal issues, unhealthy lifestyle or heredity, you always have the chances to develop alopecia, progressive hair thinning, patchy hair loss, or even complete baldness. In order to combat this issue successfully and stimulate the growth of your hair significantly, mesotherapy can be a wonderful solution for you. Read the rest part of the article and know all about the process. The term ‘mesotherapy’ refers to an alternative treatment for hair loss, which majorly helps in delaying baldness and accelerating hair growth. In this non-surgical cosmetic procedure, micro-injections are pushed into our scalp in order to provide vitamins, minerals, proteins and other vital nutrients to our hair. As a result, the blood circulation is boosted throughout the scalp and the hair follicles are rejuvenated, which eventually speeds up the growth of new strands. 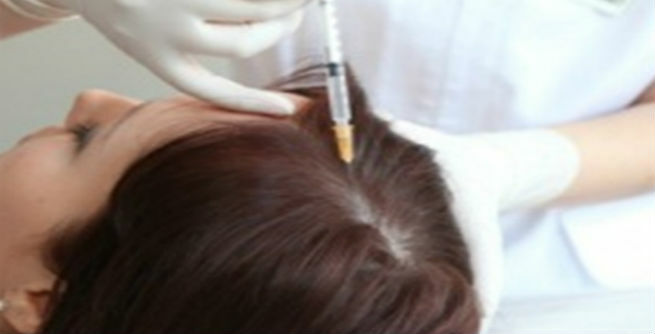 In mesotherapy, a special injection gun with a sterile needle is used to insert a nutrient-rich fluid into the middle layer (mesoderm) of the scalp. Usually, the solution is made of certain nutrients that are absolutely tissue-friendly and hence, are approved by the experts. However, depending upon the requirements of the patients, the compositions of the fluid may vary. Being a non-invasive method, it involves minimal to no pain as well as downtime. The entire process of mesotherapy is divided into 8 sessions each of which is half-an hour long. Patients need to undergo 1 session each week. The result will only be visible after 4th or 5th session. Hence, you should not be impatient. Well, mesotherapy needs some post-procedure care and maintenance. After going through the process, one needs to follow a well-balanced diet and healthy lifestyle. Regular workout is a must and consumption of junk foods is a strict ‘no-no’ for this treatment method. • Being a non-invasive procedure, it is almost pain-free. • There is no significant downtime. You can get back to your regular work schedule instantly. • Recovery time needed in this treatment is comparatively shorter. While you may have to wait one or few months to notice the results in other cases, this process gives you visible results in 4 to 5 weeks only. • The results are quite impressive. You can truly get rid of partial as well as complete baldness by opting for this method. • It is much cheaper than other similar surgical procedures. • It is also safer than several other hair loss treatment methods. Even though the mesotherapy for hair growth is a comparatively safer process, there are quite a few side effects associated with it. These include bruising, swelling, infections, allergies, burning sensation, inflammation, rashes, lumps, skin discoloration and mild pain in the treated areas. So, keep all these points in mind and take a well-informed decision.